I’ll be speaking at the Advanced Engineering conference in Helsinki at the end of May. My topic will be potential solutions for future transport, covering land, sea, air and space. These are all areas where I’ve invented new approaches. In my 1987 BT life as a performance engineer, I studied the potential to increase road capacity by a factor of 5 by using driverless pod technology, mimicking the packet switching approach we were moving towards in telecomms. 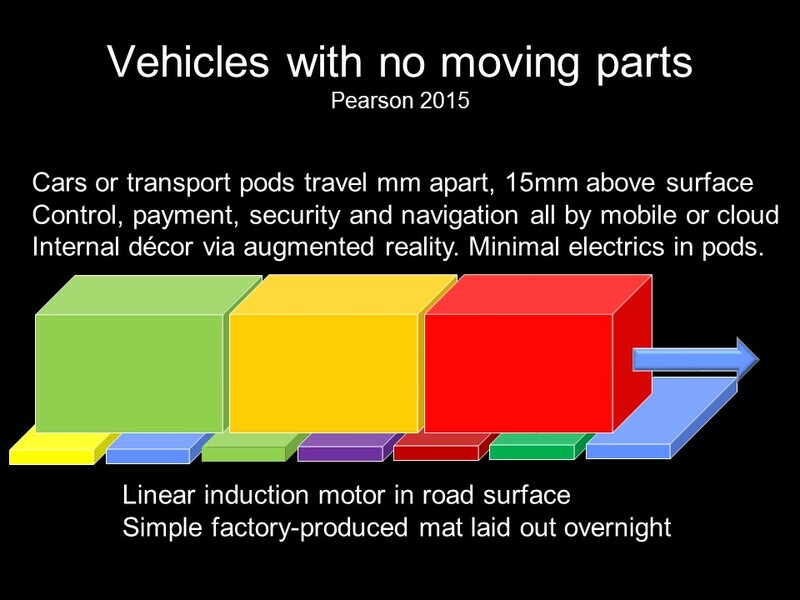 This is very different from the self-driving systems currently in fashion, because dumb pods would be routed by smart infrastructure rather than having their own AI/sensor systems, so the pods could be extremely cheap and packed very closely together to get a huge performance benefit, using up to 85% of the available space. We’re now seeing a few prototypes of such dumb pod systems being trialled. It was also obvious even in the 1980s that the same approach could be used on rail, increasing capacity from today’s typical 0.4% occupancy to 80%+, an improvement factor of 200, and that the same pods could be used on rail and road, and that on rail, pods could be clumped together to make virtual trains so that they could mix with existing conventional trains during a long transition period to a more efficient system. In the early 2000s, we realised that pods could be powered by induction coils in the road surface and more recently, with the discovery of graphene, such graphene induction devices could be very advantageous over copper or aluminium ones due to deterrence of metal theft, and also that linear induction could be used to actually propel the pods and in due course even to levitate them, so that future pods wouldn’t even need engines or wheels, let alone AI and sensor systems on board. We thus end up with the prospect of a far-future ground transport system that is 5-15 times road capacity and up to 200 times rail capacity and virtually free of accidents and congestion. 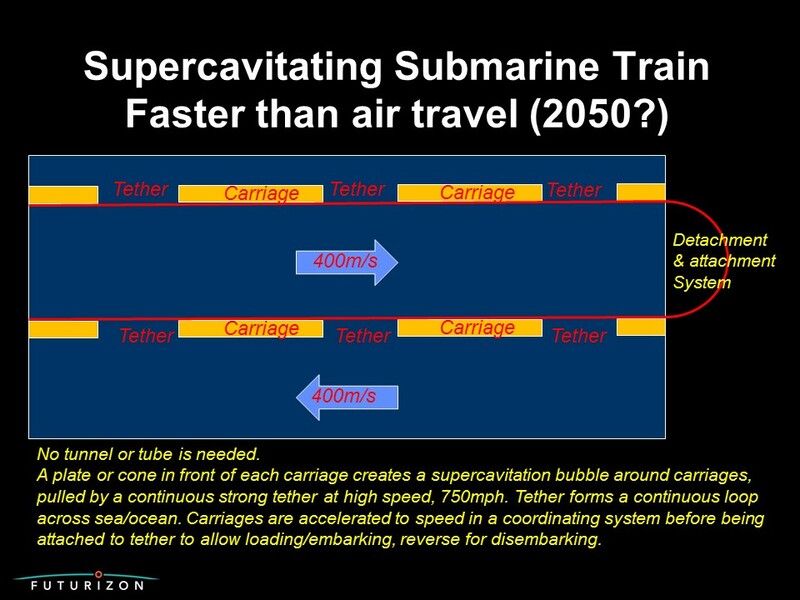 Advanced under-sea transport could adopt supercavitation technology that is already in use and likely to develop quickly in coming decades. Some sources suggest that it may even be possible to travel underwater more easily then through air. Again, if graphene is available in large quantity at reasonable cost, it would be possible to do away with the need for powerful engines on board, this time by tethering pods together with graphene string. Above certain speeds, a blunt surface in front of each pod would create a bubble enclosing the entire pod, greatly reducing drag. Unlike Hyperloop style high-speed rail, tubes would not be required for these pods, but together, a continuous stream of many pods tethered together right across an ocean would make a high-capacity under-sea transport system. This would be also be more environmentally friendly, using only electricity at the ends. Another property of graphene is that it can be used to make carbon foam that is lighter than helium. Such material could float high in the stratosphere well above air lanes. With the upper surface used for solar power collection, and the bottom surface used as a linear induction mat, it will be possible to make inter-continental air lines that can propel sleds hypersonically, connected by tethers to planes far below. 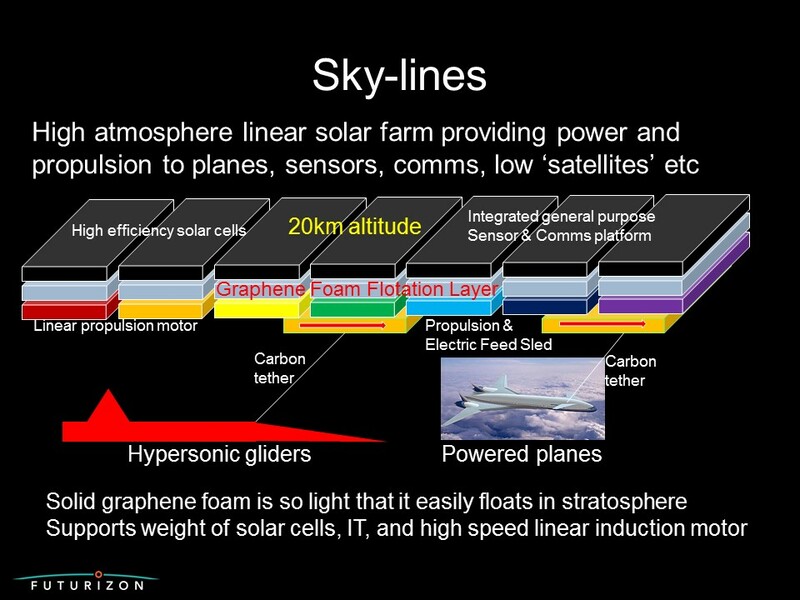 As well as providing pollution-free hypersonic travel, these air lines could also double as low satellite platforms for comms and surveillance. As well as land, sea and air travel, we are now seeing rapid development of the space industry, but currently, getting into orbit uses very expensive rockets that dump huge quantities of water vapour into the high atmosphere. A 2017 invention called the Pythagoras Sling solves the problems of expense and pollution. 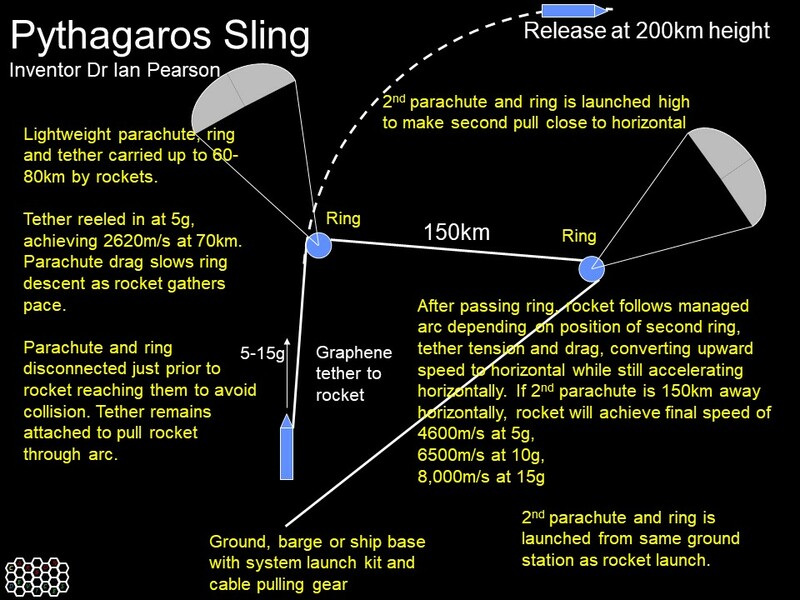 Two parachutes are deployed (by small rockets or balloons) into the very high atmosphere, attached to hoops through which a graphene tether is threaded, one end connected to a ground-based winch and the other to the payload. The large parachutes have high enough drag to act as temporary anchors while the tether is pulled, propelling the payload up to orbital speed via an arc that renders the final speed horizontal as obviously needed to achieve orbit. With re-usable parts, relatively rapid redeployment and only electricity as power supply, the sling could reduce costs by a factor of 50-100 over current state of the art, greatly accelerating space development without the high altitude water vapour risking climate change effects. The winch design for the Pythagoras Sling uses an ‘inverse rail gun’ electromagnetic puller to avoid massive centrifugal forces of a rotating drum. The inverse rail gun can be scaled up indefinitely, so also offers good potential for interplanetary travel. 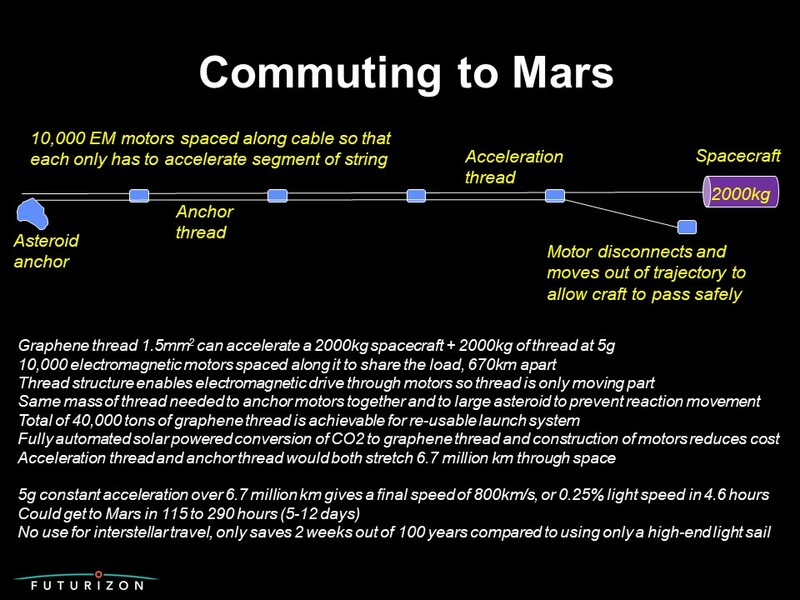 With Mars travel on the horizon, prospects of months journey times are not appealing, but a system using well-spaced motors pulling a graphene tether millions of km long is viable. A 40,000 ton graphene tether could be laid out in space in a line 6.7M km long, and using solar power, could propel a 2 Ton capsule at 5g up to an exit speed of 800km/s, reaching Mars in as little 5-12 days. At the far end, a folded graphene net could intercept and slow the capsule at 5g into a chosen orbit around Mars. While not prohibitively expensive, this system would be completely reusable and since it needs no fuel, would be a very clean and safe way of getting crew and materials to a Mars colony. 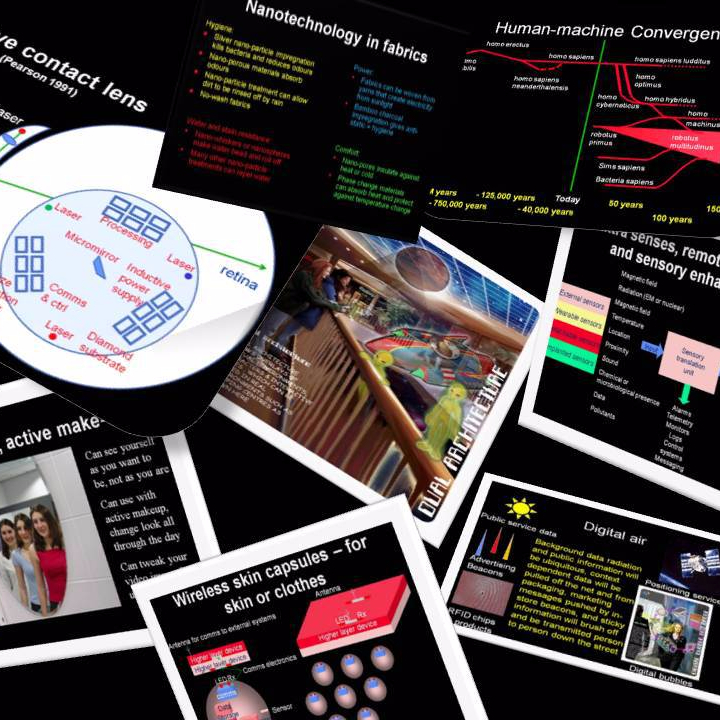 This entry was posted in environment, graphene, materials, technology, transport, travel and tourism and tagged future transport, graphene, space. Bookmark the permalink.